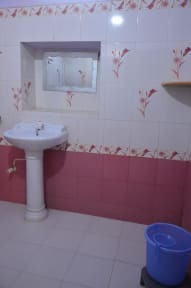 We are a friendly, family, run hotel in the beautiful and historic city of Jaisalmer. On a quiet residential street but a short walk from the fort, palace and popular Haveli's of the city. We offer 12 Rajasthani style decorated rooms with ensuite up-to-date bathroom and Standard Dorm beds to suite all travelers budgets. We offer pristine, comfortable and delightfully decorates rooms in a relaxed atmosphere and are dedicated in providing pleasant, friendly service with the Fort and City View. We also organize value for money Camel Safaris from 1 day to as long as you like which we highly recommend as a wonderful and unique experience since 1988. We have a hotel and restaurant facilities with we also offer different tours.Our Hotel services include free WiFi, Internet, tour information (including sightseeing, camel & jeep safaris), laundry service, currency exchange, help to book your flights, train, and buses tickets, and Free pick up and drop to /from the train / bus station.Our guests are the most important!! And we prefer for our extensive facilities and warm atmosphere that will make you feel at home, here you can meet people from around the world, share experiences with other travelers, learn from different cultures or if you prefer, you can relax on our terrace enjoying your tranquility.You can use the store room to store your belongings if you have checked out and need to drop the luggage for a while. We believe in not asking anything in exchange apart from a wide smile. 10 mints in tuk-tuk from the bus stand. 10-15 minutes in tuk-tuk from the Train station. 18 Kms from the Airport.